Cosmo celebrates R.D. 's 60th birthday. Cosmo loved a hearty pat on the ribs and a little roughhousing headlock or an ear boxing. If he didn’t get the attention he wanted from me, he would rub his big head against my thigh and prod my hand with his big, cold nose, looking up at me as if to say, “C’mon, already! You know the routine!” Indeed, I did. I could never resist his affectionate solicitations. And so it was that Cosmo became the hiking and Geocaching mutt that we will always remember. He was always ready for a hike, even through mid-2009, as his “man years” equivalent age eclipsed the ages of his sexagenarian owner and me by a considerable margin. Later in life our canine buddy was hampered by various ailments, the most serious requiring surgery for some cancerous growths on his flank. After the surgical wound healed, he was right back out on the trail with us, conducting his important trailblazing, protection, and herding business as usual. But his face and his whiskers were growing whiter and other ailments started to creep in, slowly claiming his vitality. Eventually, Cosmo could not hike in the heat and his endurance withered. He could no longer manage the 12 mile hikes he had loved to share with us. He began to limp. R.D. took him to a holistic vet, a massage therapist, and an acupuncturist. They provided some temporary relief, but eventually, Cosmo even had to skip the morning walk around the lake that he loved so much, and hiking was completely out of the question. In the end, the beloved animal had trouble just standing up, and could take only a few steps when he did. Sadly, R.D. knew that the time had come for Cosmo’s suffering to end. I’ve written eulogies before, but I’ve never written a paragraph that brought tears to my eyes and heaviness to my heart like the preceding one. Cosmo, you were loved by so many of us, and I’m happy that you are in a better place, gleefully hiking, chasing rabbits and armadillos, and taking that morning walk around the most beautiful lake ever. Rest in peace, old buddy. Perhaps one day when we meet again we can have some nice hikes together. What a beautiful tribute. I never had the pleasure of meeting Cosmo but I’ve enjoyed hearing stories about him and looking at photos of him through the years. He sounds like he was a wonderful companion and dedicated hiker. May he rest in peace. He was indeed special, and he will have a special place in the hearts of all who knew him, eternally. Aww, Ben, you made me cry, too. One of my favorite memories of hiking with Cosmo happened at Lower Wekiva Preserve, when he found a solitary black mud patch and waded through it. It looked so good, I took my hiking shoes off and did the same. And he was always so positive. Only once can I remember him thinking that fools rush in where angels fear to tread. I almost put that “muddy feet” picture (yours and his) in the remembrance post, but his face wasn’t in it, so I decided not to. There were so many memories I couldn’t put them all in. One of them was the time we had to ford Rock Springs Run on our Northwest Passage hike. As we all waded across the cool, waist deep water, Cosmo hung back at the canoe put-in, not wanting to get his little footsies wet. Finally, after you failed in cajoling him to join us, R.D. had to wade back across the creek, pick him up, put him in the water, and guide him with the leash to get Cosmo to swim to the far bank. The look of terror on his face while swimming was priceless. Of course, I have a picture of it. Once he got to our side, he shook himself off and completely forgot about the harrowing experience. He was ready to look for the pine trees and the more open area ahead. A slight miscalculation, which will no doubt destroy my credibility as a trail guide forever. However, Cosmo’s instincts were always dependable. You have a remarkable memory! Thanks for capturing some of the best moments of a companion I shall dearly miss. I’ve looked after several dogs and been privileged to know many more. Cosmo stood at the front of the pack. He had a soft manner and a warm heart that touched most who knew him. Thanks for remembering. Thank you, R.D., for allowing me the privilege of having known Cosmo. That really makes me sad. I really enjoyed his company and will miss him very much. RD – thanks for sharing him with us. Thank you for sharing this story, Ben. R.D., I’m so sorry to hear of your loss. I know Phoenix, Dagger and I had the privilege of hiking/geocaching with Cos, R.D. and Ben on quite a few occasions – one being the Bushwack of Death March in the Seminole State Forest. Phoenix is now 12.5 and Dagger just turned 10 and I treat every day that I have with them as a blessing! Cosmo couldn’t have chosen a better door to show up at on that fateful day. 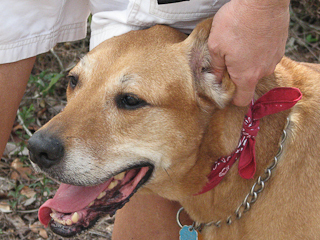 Cosmo always enjoyed human and canine companions, especially during the geo-caching hikes. Your treats and hugs were always appreciated (and, of course, never sufficient ;-}). Fortunately, Cosmo, Phoenix, Dagger, and Bailey did not have to complete the death march with us. As I recall, once the brush got thick, you decided that the palmettos would be hitting poor Phoenix right in the face and you didn’t want him to have to put up with that. Therefore, it was decided that R.D. would dog-sit in a shady, but somewhat open spot, while we three idiots (Jon, you, and I) trudged on in the Bushwhack of Death. When we returned, they were all shady and happy; we were all scratched up and sweaty. The dogs got further revenge when we returned to my Grand Cherokee, in which we had left a plastic bag containing dog turds picked up from the pooches’ public pooping. We had been gone four hours while the Jeep sat in the sun, creating a baking oven in the back where the doggie do was. The aroma was very bold upon our ingress to the polluted vehicle. On the last morning of the Campfire event, you, Andrew, Bob, R.D., Marc, and the dogs set out to find the Kerberos cache, using a more accessible route. I slept in that morning, so I missed it, but I understand that Dagger was lost for a long time, sparking great fears for his mommy. What a wonderful story you have told. I think of Cos as my good buddy, he was a gentle giant like his Dad, and always willing to share what he had. And what he had was a large good nature, courage, humor and understanding of a lot of things human and dog. As a young dog, Cos came to visit in California, I had two Dobie pups at the time, about his age. The three of those dogs romping and racing together was an amazing sight. I hope they are racing together now. Its always a privilege to be close to a great heart. Hi Mark. Thanks for sharing your memories of Cosmo. I’ve heard the story of Cos and the Dobies from RD a few times; it’s one that makes me smile every time! Cosmo was indeed a great dog with a great heart. What a wonderful tribute to Cosmo and RD. Thanks Ben! I first met RD (aka Bob) when he hired me to work for him in the early 1980s at Westinghouse. At that time Bob had a wonderful Dalmatian, Rufus, whose passing clearly left a void in Bob’s life. I was so pleased when Bob found and adopted Cos. They were best-buddies. Bob and Cosmo visited us at Companion Camp several times to help with the IT and website for our new business. My fondest memory is of Bob and Cos taking a nap in the spooning position on our living room floor after a nearly all-night computer session. Cosmo was very special to Bob and to all who met him. We still feature Cos on our website (http://www.companioncamp.net/index.html#cosmo). Our deepest sympathies to Bob. Cosmo will truly be missed. Sorry that your comment didn’t get posted until today. Because of the preponderance of spam comments, I filter comments from unregistered users if they contain links to external web sites. Yours made it into the spam pile, which I didn’t check until RD alerted me to the fact that you hadn’t yet seen your comment. Now that I’ve fixed it, I can thank you sincerely for adding to this thread. I stayed with him a few times. When he’d back against the bed, it was like having a bus back into you. When he’d rest his chin on the mattress, you’d be lucky not to roll off on the floor. When visiting ‘clingy dog’, he would lean against me, rather like being leaned upon by a collapsing building. If Bob and I chatted too long, he’d run to the door and whine. I’d say, “What? It’s Timmy? Timmy’s trapped in the mine?” It was a good excuse to go outside and check the trees for messages. Cosmo didn’t like sharing space with my cockatoo, Valentine. When Valentine flew into the room, Cosmo got a disgusted look on his face and stalked out. When Cosmo walked by on his way to his water dish, Valentine would stretch down and take a “Hey, pal!” swipe at the dog. Yet, when burglars parachuted onto the front lawn (or possibly just the newspaper being delivered), Valentine and Cosmo teamed up to deliver a hellacious barking cacophony that kept invaders and Jehovah’s Witnesses at bay. In his latter days, Cosmo found a girlfriend, or rather she found him. Dump Truck, er, Lucy, was a bulldog who seemed quite taken with her May-December relationship. Cosmo was, well, tolerant, and when Dump Truck crossed his patience line, he let her know, which only augmented her love for him. You can read about Lucy here. My favorite photo of Cosmo is in the middle of this article– click for the impressive enlargement. Leigh, your prose is always entertaining and I appreciate you sharing your memories of Cosmo here for all who visit this thread. Thanks! I’ll add a link to your blog on my blogroll just in case my two regular readers would like some variety. Thanks, Rebecca. I’m sure you would have loved Cosmo. What a wonderful tribute to a wonderful dog! As a fellow dog owner, this tribute to Cosmo hit me straight in the heart. Cosmo definitely brought lots of joy to the humans and non-humans he got in contact with, and he left a lasting impression. Very poignant poem, Cristi! A much better fate in the great beyond than 72 virgins. I’m too old to appreciate the virgins, but one is never too old to appreciate an old friend. Cosmo was a most observant dog. Cracked me up when he came to Delware for Xmas visit and religiously checked out all the places high and low that toys, treats or fuzzies had previously lurked. So what if that fuzzy bag had a camera inside. Crunch. Fuzzy catnip, who needs a lens cap? He went into each room and scanned, floor to ceiling. Never saw another dog do that. Bottom drawer of dining room hutch, diane Im waiting here, open, now. Upstairs in office now, what is that on top of the 6′ bookcase please . . I expected him to turn around with a great big magnifying glass in paw. Cosmo was an entertaining and polite houseguest. I don’t know where he came from but he was a large personality. rd I am very sorry for your loss. I will dig out my favorite Cosmo photos next week, tune in again. Thanks for your comments, Diane. The inquisitive side of Cosmo usually manifested itself in my presence when something was opened that he thought might contain food for him. This included backpacks, pockets, and Geocaches, The big nose would instantly track its target at close range and then the eyes would ask the perp what he or she did with his food. On the trail, Cos was our canine clean-up crew. Done with that apple core? Toss it to Cos. Did that hard-boiled egg turn out to be soft-boiled? Call Cosmo over to lick the yolk off my pants. He was one helluva food hound! I look forward to seeing your favorite Cosmo photos!